Local police and sheriff’s deputies who usually spend their days writing speeding tickets or chasing robbers have switched focus to protect Gulf Coast and South Texas residents from a greater threat—Hurricane Harvey—and Houston police have already rescued about 2,000 people from flooded homes and cars. Local police and deputies across the region also switched their focus from crime-fighting to search-and-rescue. 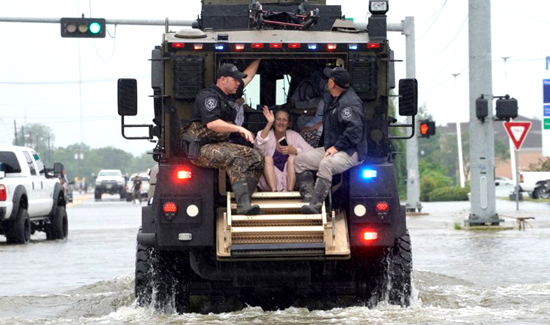 A Houston Police SWAT officer in camouflage pants carried a mother and her year-old-son through knee-deep water after rescuing them from their flooded home Sunday. Police in Richmond, about 30 miles down Interstate 69, used their black cruisers Sunday to warn drivers away from a sinkhole big enough to swallow a bus. And uniformed Houston police officers linked arms later that day to form a human chain across a bayou to save a bald-headed and barefooted man who was clinging to a tree. The most perfectly classic “Lone Star State” example came when Liberty County Sheriff’s Office deputies drove a herd of cattle down a wet highway, helped along by men on horseback and a pack of loping dogs. “Where are you taking them?” asked a CNBC producer who tweeted a video of the emergency cattle drive, as the deputies and riders drove the cows past a Hartz Chicken Buffet restaurant northeast of Houston. “Higher ground,” a deputy told her.